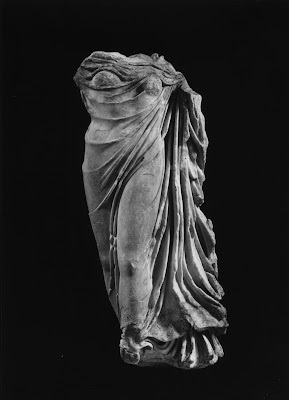 Draped goddess from "a distinguished private collection"
Christie's is due to be auctioning a 'Roman marble draped goddess' in their auction at the Rockefeller Plaza, New York on 25 October 2016 (lot 92). It is recorded as the "property from a distinguished private collection". The collecting history ("provenance") is provided as: "with Perpitch Gallery, Paris"; and acquired from there by the current owner "prior to 1991". The estimated value is $100,000 to $150,000. 1991 is some distance in time from the benchmark date of 1970 provided by the UNESCO Convention. The goddess appears to be the same as the one identified by Dr Christos Tsirogiannis in the Schinoussa Archive. This suggests that the goddess, at some point, passed through the hands of Robin Symes. Why is the collecting history for the goddess that appears in the sale catalogue incomplete? Had the due diligence process failed to make the apparent link with Symes? How had the object's history between 1970 and 1991 been explained? This sculpture was withdrawn from the sale.